With skyscrapers and iconic structures mushrooming around the world in densely populated cities, inclusion of large quantities of steel in construction of such buildings is on a rise. Currently, more than 50% of world’s steel production is used by the construction industry. Global population likely to touch 8.6 billion humans by 2030 and 9.5 billion by 2050, simultaneously the demand for buildings and infrastructure will increase with rapid growth in urbanization. Building high rise towers is one of the solutions that most of the countries have adopted to address this futuristic housing need; or at least till the time a more viable option emerges. 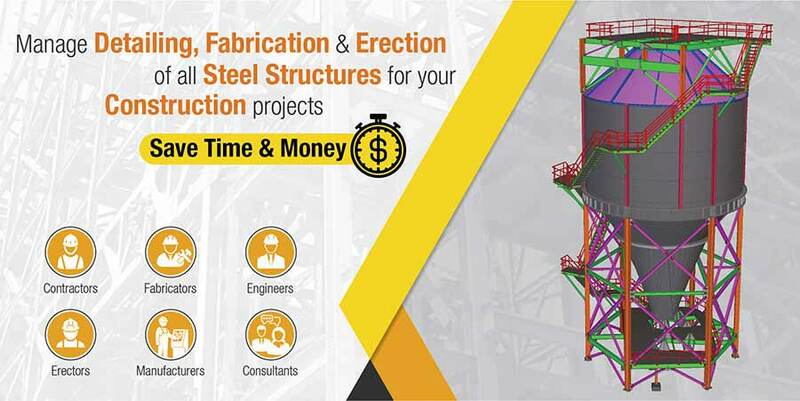 To erect tall and sturdy structures, removing inaccuracies and imparting appropriate strength to the construction with precise steel detailing is the challenge construction companies’ encounter. Construction firms, manufacturers, and fabricators have to struggle for ready to fabricate drawings, clash detection and resolution, and material take off estimates. They also have to work on projects with mix kind of concrete structures and are required to coordinate with the model prepared in software which they don’t use. Other challenges includes the cost of 3D modeling software, training in-house teams is time consuming, costlier than ever and really complicated. And in spite of investing efforts and dollars – that element of specialized steel detailing expertise still is missing. Only experienced steel detailers, well aware of various types of steels and materials and architectural details, will be in a position to answer queries about importance of structural steel detailing. This situation thus make best steel detailing companies with expert steel detailers on board, a vital aspect to urban city development. Here are answers to some of the questions by key professionals such as the architects, engineers, steel fabricators, contractors, and others, responsible for high levels of accuracy at each stage; and are looking for best CAD outsourcing companies for their structural steel detailing requirements. Why and where so much steel used in construction industry? Reason why it is used extensively across the construction industry is that steel as a material is extremely reliable, durable and has the capacity to withstand harsh weather conditions. Large and small steel components including beams, steel columns, trusses, stairs, handrails, braces, metal decking, steel joists etc., are used in construction of residential and commercial buildings, airports, bridges, oil rigs industrial plants and many more. Inaccurate structural steel detailing, designing and engineering could lead above mentioned structures to be inefficient, only to end up in disastrous accidents. Creation of steel workshop drawings or shop drawings, as the manufacturers, contractors and steel fabricators call it, is the main aim of steel detailing. It also involves creation of detailed structural drawings, design plans, and a variety of construction documents for the production and erection of steel members. These drawings detail every single steel component with material specifications, sizes and dimensions, required to be made by fabricators. Steel detailing is the most crucial activity, which professionals such as steel fabricators, engineers, architects, and contractors involved in the project, are required to communicate on amongst each other – mandatorily. Architects, engineers, steel fabricators, contractors; are required to work hand-in-hand in order to avoid any kind of mishaps during or after the construction process. Steel detailing companies usually rely mainly on CAD methods to create steel drawings. We use Tekla Structures as they are reliable and meet all of our technological needs. For detecting internal clashes of steel structures with concrete, we use Navisworks. Our structural steel detailers interpret the information and drawings as presented by client at project inception to come up with accurate shop drawings, erection drawings and steelwork fabrication drawings. We as a leading structural steel detailing company provide accurate structural drafting services and solutions to general contractors, structural design companies and fabricators for steel and rebar detailing and fabrication drawings. We provide structural detailing services as an assortment of developing elementary level drawings to advanced bill of materials with help of Tekla for steel frame construction of building and industrial construction. What is your specialization in steel detailing services? Do you comply with national safety requirements? Safety is on top priority with Hi-Tech, and hence we adhere to all national building regulations including the Building Code of Australia (BCA) and Australian standards such as AS 4100 Steel Structures and AS/NZS 4600 Cold-formed steel structures. How do I send my plans to you? No need to search for “CAD drawing services near me”. We are equipped to accept your build plans in whichever format you are comfortable sending it to us. Email them to us at info@hitechcaddservices.com if you have them in electronic format such as .TIFF or .PDF, etc. Why should I use your steel drawing services? Our deep understanding of the civil engineering domain empowers us to deliver scalable structural steel design and detailing solutions. In tune with latest building design technologies, we innovate to improve the structure’s stability, to meet regional structural design standards. Our solutions have improved the inter-disciplinary collaboration, ultimately impacting the progress of our client’s construction projects. Quality is our guarantee, and we strive to deliver exceptional steel detailing services and accurate drawings every time – on time. Even if you have in-house steel detailers, contracting us your steel detailing projects makes sense, as we supplement your existing staff without the overhead that usually comes with hiring extra full-time personnel. How much does your steel detailing service cost? For every project that we undertake, a Non-declaration agreement is signed with the clients. Confidentiality is important to us and no project or build information is ever disclosed to any third party without taking a prior consent from the client. As mentioned above, because we enter into an NDA with every client, we do not publish the list of our clients on the websites. We will gladly share the name and numbers of our past clients, who will be happy to give reference for our high-quality steel drawing services. How do you describe Hi-Tech CADD Services? As pioneers of multi-disciplinary 3D CAD modeling services, our experience spans more than 1000+ Concepts and detailed 2,00,000+ parts conforming to international standards. As a BIM Consulting and modeling service provider, we have worked for more than 50 Million Sq. Mt. and 500,000 man- hours. Our dedicated team of 30+ Tekla steel detailers, experienced Project Managers, QC Head, Team Leads, Project Leads and BIM managers overlooking structural steel detailing work, work towards a common goal of executing over 5,000 tons of structural and miscellaneous steel detailing jobs every month. What is the best way to get in touch to discuss project requirements? If you have a question that is not listed here, please do not hesitate to contact us. We will be glad to answer any queries you may have about your project or the level of service we can provide.